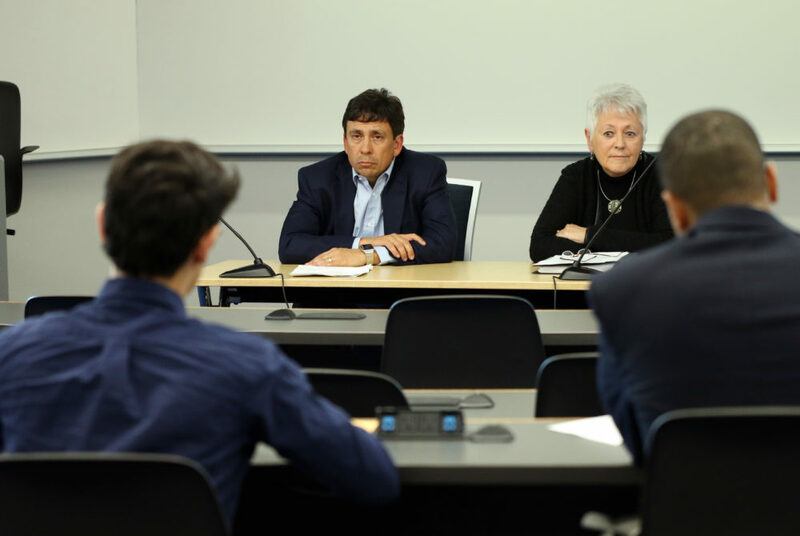 Nelson Carbonell, the chairman of the Board of Trustees, and Sally Mason, an outside consultant heading a community review of University President Thomas LeBlanc, listen as students provide feedback on the president's job performance during a forum Thursday. Six students representing two student advocacy groups turned out to two feedback sessions held last week as part of the first communitywide review of University President Thomas LeBlanc. Four students from Fair Jobs GW, a progressive organization that advocates for workers’ rights, and two students involved in the Jackie Robinson Project, an initiative dedicated to promoting the legacy of the famous baseball player and civil rights leader, attended the two feedback forums Thursday. The sessions were a part of the first University-wide assessment of LeBlanc, who agreed to biannual reviews when he was first hired in 2017. Four additional feedback sessions were held for faculty and staff on Monday and Tuesday. The students told Nelson Carbonell, the chairman of the Board of Trustees, and Sally Mason, an outside consultant heading the community review, that LeBlanc has not listened to their advocacy efforts. Junior Jared Diamond, the president of the Jackie and Rachel Robinson Society, a student organization that works closely with the project, said he has emailed LeBlanc a few times about officials’ plans to cut the initiative but has not received a response. Citing low funds, officials confirmed in the fall that they planned to terminate the Jackie Robinson Project at the end of the academic year. The announcement has garnered backlash from faculty and students involved in the program, who have sent hundreds of emails and letters to administrators, but the project is still on track to dissolve this year. “Whether President LeBlanc allows the JRP to continue will be a clear indication of the responsiveness of his administration to the wishes of GW students and other members of the GW community,” Diamond said. Members of Fair Jobs GW told Carbonell and Mason that LeBlanc ignored their requests for higher salaries and more benefits for staff. The group released a set of 10 demands last fall – including no longer hiring third-party contractors to oversee employees and paying transportation stipends for employees who commute to and from campus – which led to meetings with officials but no changes in University policy. Sophomore Emily Harding, a member of Fair Jobs GW, said workers have told members of the campaign that they feel like LeBlanc does not have their best interests in mind when he makes decisions affecting staff. Workers also told members of the group that they felt their concerns were ignored after they expressed them to officials, she said. Harding added that the president should meet staff and hear their complaints instead of relying on students to convey their messages. Senior Josh Gross, another member of the campaign, said LeBlanc should consider adding a dining hall back to campus. Officials shut down Foggy Bottom’s only dining hall in 2016 after students complained of high-cost but low-quality meals, but Gross said current dining options are too expensive and perpetuate food insecurity. “I feel like the University is kind of shooting itself in the foot by closing the dining hall because it just makes access for low-income students on campus that much harder,” Gross said.